The findings, from the University of Nottingham and which are published in the journal Antiquity, will have major implications on the history of the European monetary system, and what we thought we knew about trade and the economy during this period. The long-standing dating of all events and archaeological remains linked to the old dating of the first silver coinage will also have to change in light of the new study. The HICP research is led by Professor Michael McCormick, Harvard University and Professor Paul Mayewski, Climate Change Institute (CCI), University, University of Maine, with the University of Nottingham and the University of Heidelberg, funded by the Arcadia Charitable fund. Click here to read the article “Alpine ice-core evidence for the transformation of the European monetary system, AD 640–670” from Antiquity. 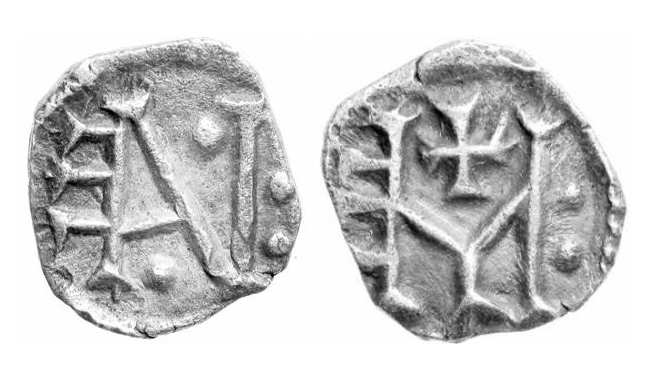 Top Image: Silver penny minted at Melle, probably struck from c. AD 660, found at Ashford, Kent: obverse (with ‘M’ and cross), and reverse views. Image courtesy Antiquity and Dr Tony Abramson/Prof Christopher Loveluck, University of Nottingham.